Try Looking For Inspiration Away From The Scale! | Keep It Up, David! Try Looking For Inspiration Away From The Scale! Time for a little bedtime reading. I was interviewed by Amy Capetta for this way back in January, and now the issue is out! It’s a free publication that’s sent around to doctors offices, medical centers, hospitals, and places like that. So keep your eyes open the next time you have an appointment, there might be a stack of them lying around! 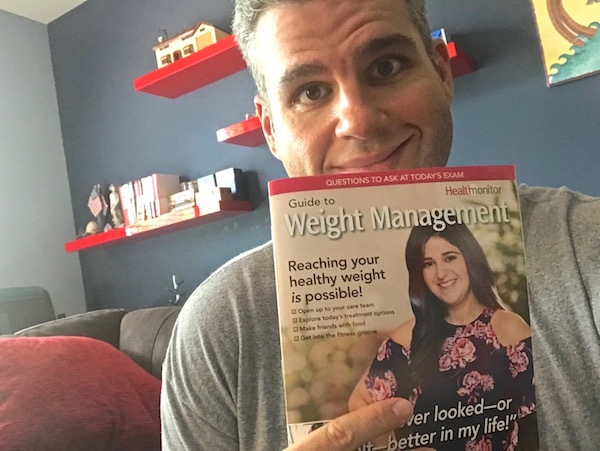 It’s a great article, where I share my story and some tips for anyone trying to lose weight. That font size is a little small, but don’t worry, I have you covered. The entire article, every word of it, is below. You don’t have to go anywhere to read it – just keep reading here! 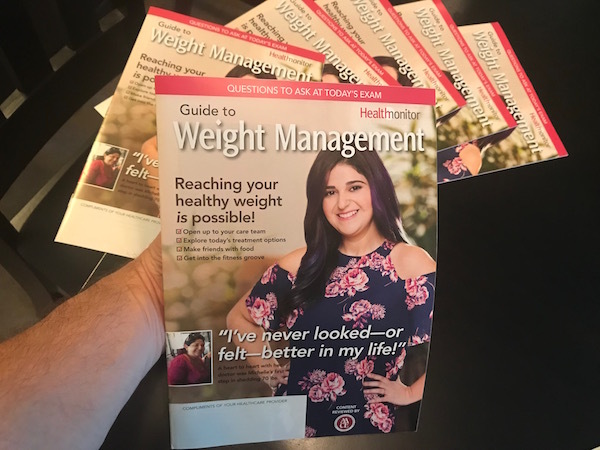 Oh, and one more random connection – Health Monitor, the publisher of the magazine, had all the articles reviewed by AACE, the American Association of Clinical Endocrinologists – the very same professional group that my father was a part of for decades. He even served on the board for a while! “One of my favorite things to do is tower running, a sport where I race up the stairwell in skyscrapers—I’ll run up 100 stories at a time. I have done 52 of these races in 19 cities across the U.S., and last March I raced up the Eiffel Tower—only 129 athletes from around the world are selected to compete in this event!” says David, who used to weigh 402 pounds. Then in 2010, an encounter with Richard Simmons changed his life. “He suggested I write down everything I ate. 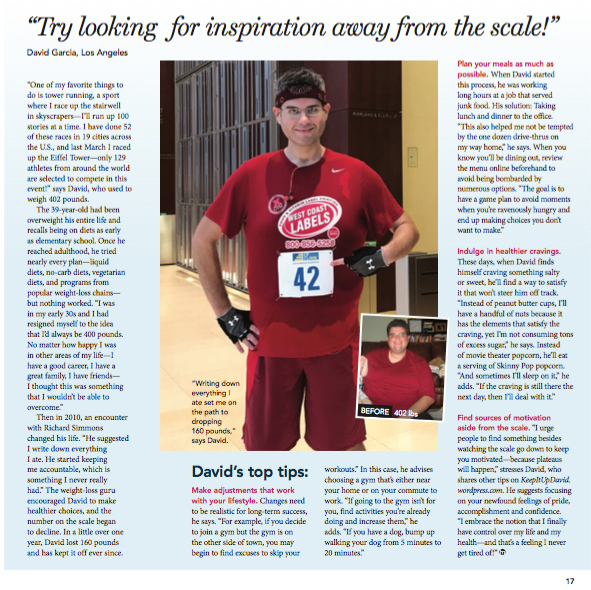 He started keeping me accountable, which is something I never really had.” The weight-loss guru encouraged David to make healthier choices, and the number on the scale began to decline. In a little over one year, David lost 160 pounds and has kept it off ever since. This entry was posted on Tuesday, August 21st, 2018 at 11:17 am and is filed under Uncategorized. You can follow any responses to this entry through the RSS 2.0 feed. You can leave a response, or trackback from your own site. 2 Responses to Try Looking For Inspiration Away From The Scale! Thanks for sharing more great advice, & congratulations on more, well-deserved publicity! Thank you G.M.! Hope to run into you soon.